Haumea - a minor planet shaped like a rugby ball! 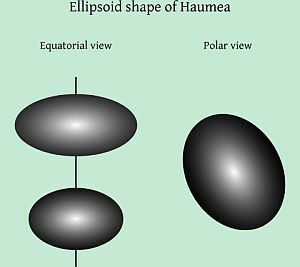 Haumea is an object found in the Kuiper Belt that has been designated as one of those new-fangled "minor planet" things - you know, like Pluto got demoted to. Only discovered in 2004, it is the fourth largest "trans-Neptunian object", after Pluto, Eris and Makemake. Its orbit is well beyond that of Pluto, being the unbelievable distance of 4,650 million miles away from the Sun. What makes it a candidate for the weirdest object in the solar system is the fact that it appears to be shaped like a rugby ball! For those of you not sure what a rugby ball looks like, here's one. As you can see, it also resembles the ball used in American football. Astronomers noticed that the new minor planet was alternating between bright and faint over the course of two hours or so. This gave an indication of its rate of spin. If the object were a normal, spherical shape, that would mean it was spinning far too fast for it to actually exist! The centrifugal force would tear it apart. The only explanation was that it was an "ellipsoid" (i.e. 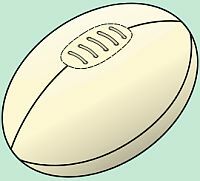 rugby ball shape) and the change in brightness was the result of its presenting its wide profile then its narrow one. This then set the rotation period to more like four hours. Even so, it is the fastest spinning object in the solar system. Just for a change, the reason for the minor planet's shape is not actually a mystery. It's a direct result of its fast spin. However, this unassuming minor planet has a few unusual facts connected with it. For a start, it has two moons. Quite a few Kuiper Belt objects have one moon, but Haumea is the only one with two. Also, in 2007, it was discovered that the minor planet featured a large, dark spot. It displayed a slight reddish tint and what it is and how it got there is still a matter of speculation.